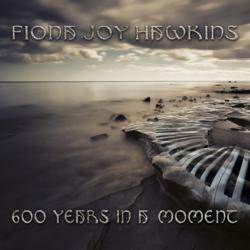 Award-winning Composer/Producer/Pianist Fiona Joy Hawkins will support her new album with U.S. Tour this Fall 2013; titled 600 Years in a Moment, it was recorded in 96/24 and will be released in multiple formats including MP3, CD, SACD (hybrid/multichannel) and double vinyl album with bonus track to accommodate audiophiles, collectors and international fans. If someone told you that your life would change in a moment, would you be ready? This question and the many feelings surrounding it are evoked by pianist, composer and singer Fiona Joy Hawkins’ new release, possibly her most significant album, titled 600 Years in Moment. The album’s visually-stunning cover art, by Australian artist Andy Wilson, fully conveys the imaginative nature and emotional expansiveness of her work. High-end production and format offerings (CD, SACD, Double Vinyl) contrast with the album’s ancient sounds and opening whisper, “Far from the shore, the winds will whisper, 600 Years and I’ll be home.” With this ground-breaking new album, Hawkins brings us the best of both worlds, old and new. Grammy-winning producer Will Ackerman calls the Australian artist "one of the brightest lights in the contemporary instrumental genre." Commenting on this album, now several years in the making, Hawkins says “I have often wondered how globalization affects music and how history changes our perception of instruments and the musical culture of our ancestors. It begs the whole question of cultures disappearing and the world becoming one big melting pot of genetics and cultures. Although, music has its own evolution and there are always new elements; we seem to allow history to co-exist with our modern approach." Hawkins’ final statement on the issue is 600 Years in a Moment itself, which was recorded using a contemporary piano from Stuart & Sons and ancient instruments from around the world. Hawkins’ vision was to bring together top musicians, their instruments and unique sounds from villages across the globe to explore the hidden musical treasures of cultures in a modern musical setting. The album is eclectic, acoustic, beautifully produced, and defies genre by bringing Classical, Jazz and World music together with New Age. There are 12 tracks in all, most extending beyond five minutes in length. Exploring time and history, bringing the past to the present, finding origins while looking into the future, 600 Years in a Moment is a journey from Fiona’s native Australia, traveling sonically around the world: it shares the distinctly Celtic flavor of her ancestors while incorporating skilled vocal and instrumental performances representing Mongolia, Hungary, China, Africa, Tibet, Ireland, the Middle East, Native America and more. Its rich, diverse sound will appeal to a wide range of piano, world, jazz, new age, and instrumental music fans around the globe. A central element in this album is the 120-key Stuart and Sons piano, of which Hawkins became aware after a move to Newcastle NSW. Knowing her passion for every note, a friend suggested she visit one of his clients nearby who happened to make pianos. “The Stuart piano factory was literally two minutes from where I was living. It was an unfortunate time in my life where for over a year I had no piano at all. Then I met Wayne Stuart who offered his showroom full of concert grands for me to practice.” Partway through recording 600 Years, Hawkins was featured in a segment about the piano on NPR’s Morning Edition. The album is also unique for the all-star production credits that include Will Ackerman, Corin Nelsen and Fiona Joy Hawkins; the album was engineered and mixed by Corin Nelsen and mastered by Bob Ludwig. Music for the album was recorded around the world in Newcastle (Australia), at Imaginary Road Studios (Vermont), Los Angeles, New York, Bremen and Portland (Maine), and Halifax (Canada). Ackerman and Hawkins perform on the album, alongside Andy Busuttil, Rebecca Daniel (Australian Chamber Orchestra), Dave Ellis, Eugene Friesen (Paul Winter Consort), Bukhchuluun Ganburged,Tony Levin (Paul McCartney), Jeff Haynes (Pat Metheny), Heather Rankin (Rankin Family), Marc Shulman (Suzanne Vega), Todd Boston, Paul Jarman, Michael Jackson, Phil Aaberg, Alfredo Rolando Ortiz, Charlie Bisharat, Dan Houghton, and Jon Robinson. Hawkins plans to support the release with a U.S. Tour this Fall 2013, with fellow Australian artist Trysette. The pair's 2012 tour garnered strong reviews; Hawkins' status as an ARIA Finalist, MusicOZ Winner, ZMR Album of the Year winner, and IMA Finalist ensures that she is set to deliver a powerful live performance for her fans. The album is being buoyed by media interviews, radio promotion (LAZZ), street team campaigns, and social media marketing. North American retail distribution is handled by CPI Distribution; the album is available for download and also in CD, SACD hybrid/multichannel 5.1 surround sound and Vinyl formats (as double gatefold 180 gsm) manufactured by Furnace, in Holland, for the audiophile market. For international sales info, visit the artist's official website (http://www.fionajoyhawkins.com.au); U.S. purchases are also available via CDBaby and iTunes. Suggested CD Retail Price is $14.98.